The Senate’s last World War II veteran, who has died at age 89, fought for big, bold government investments in jobs and infrastructure. And he was right to do so. Frank Lautenberg, the son of a Paterson, New Jersey, silk mill worker and the last World War II veteran serving in the US Senate, took his cues from another political time: a time when liberals were bold and unapologetic, a time when it was understood that government could and should do great things. One of the few members of Congress who could remember listening to Franklin Delano Roosevelt on the radio and going to college on the initial GI Bill, Lautenberg served five terms in the US Senate as a champion of great big infrastructure investments—especially for Amtrak and urban public transportation—great big environmental regulations, great big consumer protections and great big investigations of wrongdoing by Wall Street. It can fairly be said that the New Jersey senator, who died Monday at age 89, kept the New Deal flame lit. Indeed, one of his last major pieces of legislation proposed to renew one of FDR’s greatest legacies: the Works Progress Administration, which provided public-works employment for millions of Americans during the Great Depression that defined Lautenberg’s youth. A self-made millionaire who paid his own way into politics at age 58, Lautenberg never forgot that government programs lifted him out of poverty. And he refused to bend to the austerity fantasies of official Washington. Indeed, he attacked them with gusto, especially after returning to the Senate in 2003 following a bizarre turn of political events in the early years of George W. Bush’s presidency. First elected to the Senate in 1982, Lautenberg retired in 2000, saying he was sick of the money chase required to fund big-budget campaigns. Two years later, New Jersey Senator Robert Torricelli, a more centrist Democrat with whom Lautenberg had frequently sparred, was hit with a corruption scandal in the midst of the 2002 campaign. Torricelli had to quit, creating a circumstance where it looked as if the Republicans would take the seat virtually by default. 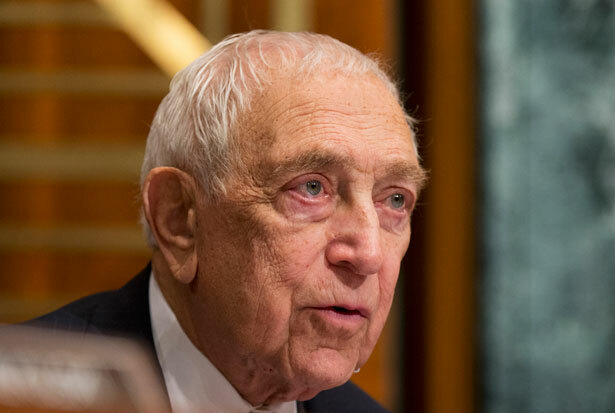 But Lautenberg elbowed his way into the race, fought in the courts for a place on the ballot and was easily reelected to the Senate at age 78. While other Democrats were still trying to figure out how to take on the Bush administration, Lautenberg arrived ready for a fight—calling for investigations into the Bush-Cheney White House and launching blistering attacks on political cronyism. Democracy for America's Jim Dean recalls that the new senator was "vigorously opposing the war in Iraq when far too many Democrats in Washington stood silent." Lautrenberg was, as well, an ardent foe of the social-conservative policies of the administration—and of Democrats who were willing to compromise with the White House. Unabashedly pro-choice and pro–LGBT rights, Lautenberg was a leading champion of gun control who, when his long battle with cancer and related ailments took a turn for the worse this spring, said that one of his biggest regrets was missing the debates over new gun-control legislation because “my victories over the gun lobby are among my proudest accomplishments.” The senator was, as well, a fierce defender of affirmative action—earning the admiration of the NAACP, along with a 100 percent rating for his votes. And, as Senator Bernie Sanders noted, "He was also one of the great environmental champions in Congress." Lautenberg’s liberalism was robust. Unlike many members of the Democratic Caucus, his commitment to the ideology was of the broad-spectrum variety. Yes, Lautenberg was one of the most committed social liberals in the Senate. But like his old friend Paul Wellstone, Lautenberg was equally committed to economic liberalism. The New Jersey senator sided with organized labor and earned top ratings from the Drum Major Institute for his battles on behalf of working families. A businessman who never forgot that his dad sweated in the silk mills and died young, Lautenberg fought for minimum-wage hikes, factory safety and fair trade—a commitment that led him to break with the Clinton administration to oppose the North American Free Trade Agreement. But his biggest fight was for a renewal of the New Deal commitment of government to invest in job creation. Lautenberg really did believe in putting the government to work on the task of putting people to work. His legislative record was packed with proposals for infrastructure investment and jobs programs—including the recent American Infrastructure Investment Fund Act of 2013, with its plan for a $5 billion fund to incentivize private, state and regional investments in transportation projects around the country by providing eligible products with financial assistance. Even after he announced that he would retire in 2015, at the end of his current term (which will now be filled by an interim senator appointed by Republican Governor Chris Christie), Lautenberg kept that New Deal flame lit. Barely a week before his death, the senator was one of the first members of Congress to respond to the bridge collapse of the Interstate 5 in Washington State. Frank Lautenberg, who made his fortune in the private sector before ever considering a political career, had no patience with those who would limit the ability of government to respond to the physical crisis of a bridge collapsing or the human crisis of widespread unemployment. Like FDR, he understood the power of government to renew the economy. John Nichols is the author (with Robert W. McChesney) of the upcoming book Dollarocracy: How the Money and Media Election Complex Is Destroying America. Center for Media and Democracy executive director Lisa Graves says: "The billionaires are buying our media and our elections. They're spinning our democracy into a dollarocracy. John Nichols and Bob McChesney expose the culprits who steered America into the quagmire of big money and provide us with the tools to free ourselves and our republic from the corporate kleptocrats." Where have the seven seas gone? Read Lewis Lapham’s essay.